Beauty Products That I Finished In May 2015- Empties !! You know how difficult it is to finish a beauty/makeup product when you have tons of stuff ... Huh... I feel like winning a mini-Olympics when I use some product regularly and actually finish it !! 1. Garnier Ultra-lift Anti-Ageing Serum+Cream: This has been a beauty staple for me for a long time now. I am in my twenties and don't really need to include any anti-ageing product in my skincare regimen yet but during and after pregnancy my skin suffered the effect of hormonal fluctuations and was not really at it's best so I bought this anti-ageing cream which comes with the goodness of both a serum as well as a moisturizer. It does work and shows the results right from the first application. You can read the full review of garnier ultra lift anti-ageing serum+cream on my website. I am definitely going to buy another bottle. 2. VLCC Protein Conditioning Shampoo: An affordable shampoo which makes the hair shiny and more manageable without weighing those down. I loved this shampoo because it kept my hair oil-free and non-greasy for 4-5 days which is a huge plus because my scalp tends to get oily on the third day and I normally can't resist using shampoo every alternate day. I did notice a significant improvement in the shine overall health of my hair. This shampoo is yet to be reviewed on the website but it's detailed review is coming up soon. 3. Nivea Pure And Natural hand cream: My all time favourite affordable hand-cream which is perfect for people with normal to dry skin. However people with extraaaaa dry skin might not be satisfied with it but considering it's affordability it can be given a try. It's contains nature's goodness and feels extremely light weight. You can read the detailed review of this Nivea pure and natural hand cream on my website. 4. St Ives Soothing Oatmeal & Sheabutter Body Moisturizer : This is my HG product and I just loveeeee it. It is such a rich, moisturizing and soothing body lotion which is perfect for any level of dryness that you may have in harshest of the weathers. It does work against itching, redness and soothes the burning sensation...ideal to be used in those difficult months of pregnancy when you get terrible urge to itch on your skin. If you looking for a really good body lotion then invest in this one from St Ives. Read the detailed review of St Ives Soothing Oatmeal And Shea Butter Body Lotion before buying. 5. Summer's Eve Intimate Wash For Sensitive Skin: For overall hygiene and health it's must to include an intimate wash in the products you use on daily basis to cleanse and nourish your other body parts. The one I love is from Summer's Eve, comes in two variants - for normal skin and for sensitve skin and has got everything that you look for in a good quality intimate wash. It does not burn, irritate or dries out the delicate skin down there. It is very gentle and doesn't interfere with the natural pH level of the intimate area. I highly highly recommend this. Check out the review of this intimate wash from Summer's Eve to know more details about it. These are the 5 products which I did manage to finish in the month of May,2015. 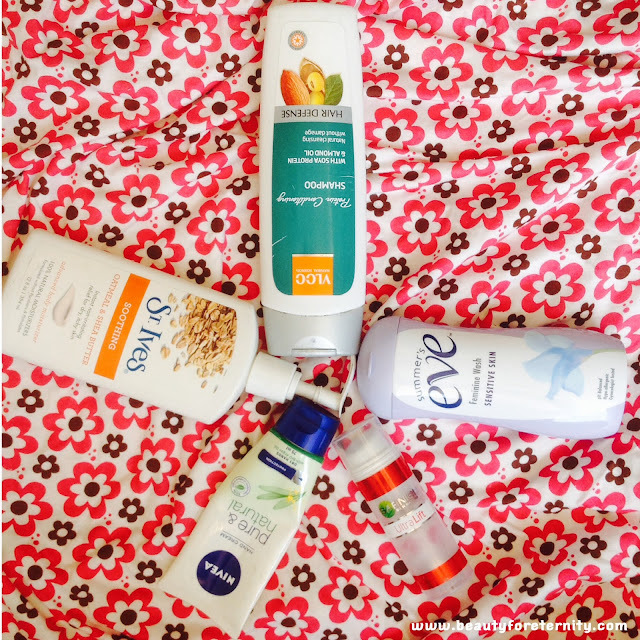 Out of these I am definitely going to buy 4 products again but not sure about the VLCC shampoo. I want to try something new for my hair which I have been eyeing on for a few weeks now. You might see that in some shopping haul here so keep following me to get notified. 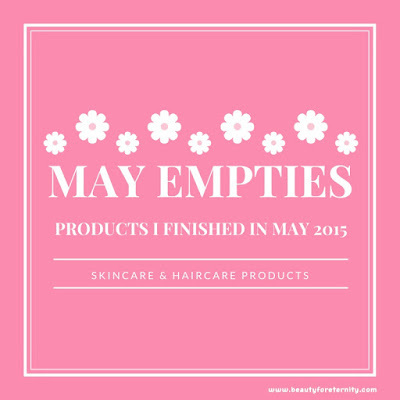 Did you finish any products in May,2015 ? Have you used any one of the above featured products ? Do share with me in the comments below.